Tim can help with most anything including tax incentives, worker training, and improved recruitment strategies for businesses. And for job seekers mastering technology to improve your job search, building your resume, and improving interview skills. For questions or to set an appointment for, contact Tim Rubio at (509) 254-7357 or (509) 758-1716. 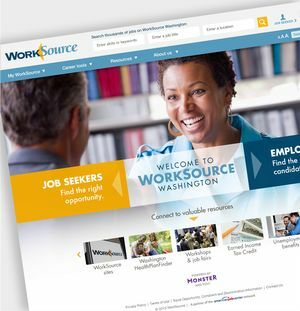 Visit worksourcewa.com for more info. 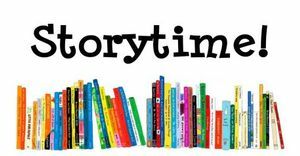 Early Learning Storytime at the Colfax Library is a FREE program that offers a valuable listening and pre-reading experience for children birth to age 5. Children, parents/caregivers will enjoy engaging stories and participate in imaginative activities that include songs, fingerplays, action activities, crafts, puppets, and more each Thursday (unless library closed) Sept.13-June 6. Call 509-397-4366 for details. Come join us every Thursday at 10:30 a.m. for Early Learning Storytime. In LaCrosse we read stories, dance, craft and have a snack. All kids 6 years and younger are welcome to attend. Older siblings are always welcome. Flex & Flow Yoga meets every Thursday from 12:05 to 12:55 p.m. in the Colfax Library's meeting room. Flex and Flow is suitable for all levels. Poses focus on foundation, alignment, and breath; while building strength, flexibility, and focus. This class introduces Sun Salutations, linking movement with breath. It includes breath work (pranayama), joint opening, standing and seated poses, meditation, and relaxation. Modifications are offered to personalize your practice to your desired level. Cost is $10 per session. Punchcards are available for purchase. For more information, contact Suzy at (509) 397-4709 or the Colfax Library at (509) 397-4366. 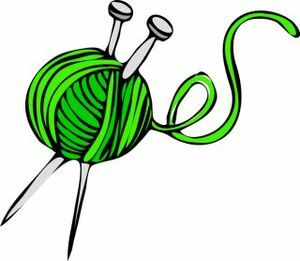 Our weekly gathering is a wonderful time to craft, create, and connect. 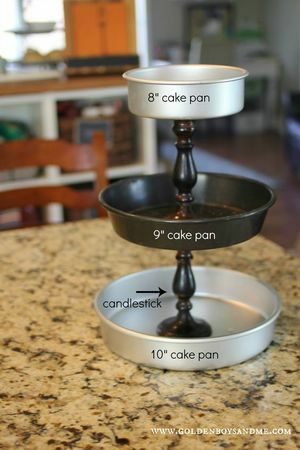 Bring a project that you are currently working on or just come to visit. From time to time we will work together on special projects. Let us know if you have a talent you would like to share or a project you need help with. Held every Thursdays at 4:30 PM unless the library is closed. Whitman County Heritage is coming to our branch! 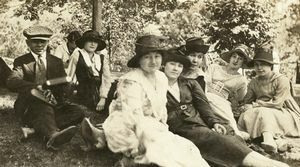 Join us for a slide presentation and discussion of historically significant photos from the area. Share your stories and browse the display! Sponsored by Whitman County Rural Library District. Thursday, Apr. 25, 5:30 p.m. Wanted: Pennies, Dimes & Dollars Too! The Whitman County Rural Library System holds its annual Penny Drive April 7-26 in honor of National Library Week, which runs April 7-13. Each of the 14 library branch locations collects money to fund programs or projects that are vital to their location. Contact the Colfax Library at 1-877-733-3375 for details. Make sure you drop by the library booth at the St. John Fair to see what's new at the library. The prize wheel will be up and running for kids. Sponsored by Friends of St. John Library. Join WCL for FFN Play & Learn (playgroup) each Friday from September through June (excluding holidays). 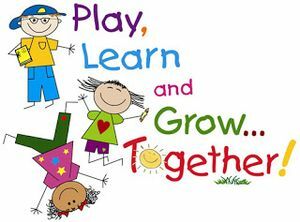 Parents/caregivers bring your children from 10:00-11:30 a.m. for early learning free play and socialization. Call 397-4366 for details. Sponsored by Child Care Aware through DEL of Eastern Washington . Please join us on Fridays at 10:30 am for storytime. We read, we play, we make art and learn about letters, nature, numbers, animals, all sorts of things!! Sponsored by Friends of the Palouse Library. Friday, Apr. 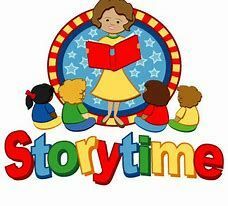 26, 10:30 a.m.
Uniontown Storytime is held on Fridays during the school year at 10:30 a.m. We teach early learning skills through crafts, color pages, songs, and stories, and we have a snack while we are reading. Storytime is geared toward kids ages 2-5 and teaches them to work, play, and socialize with other children their age, helping to prepare them for preschool and kindergarten. Sponsored by Friends of Whitman County Library. "Move it or Lose it," a FREE gentle fitness class will be on FRIDAY this week at 11 a.m. in the CENTER at Colfax Library. This class offers a fun, full body workout to improve cardiovascular endurance, strength and balance. The program is designed to meet each participant at their own fitness level. Sponsored by Whitman Hospital Therapy Services. Sponsored by Friends of the Malden Library. Grades 6th through 12th come join us for teen night. Dinner and drinks will be provided. If you have any questions, please call the Malden library at (509) 569-3350 or stop in the Malden library Wednesday or Friday from 2-6 p.m.
Come see the exciting new artwork and photography in the Libey Gallery located in The Center at Colfax Library. The South gallery features colorful oil paintings of the Palouse by Jacquline Daisley, including old trucks, farm scenes and landscapes. New exhibits in the North Gallery include Nancy Rothwell’s “Freedom and Joy,” an exhibit of acrylic collage paintings, she once again uses symbols to tell a story. The beauty and freedom of female dancers plays well against other symbols (like house keys) which represent the opposite of freedom. Again, she wants to leave mystery so the viewer establishes their own interpretations of the stories being told. Tom Mohr captures the culture of our region through his large, panoramic photographs of local events and celebrations. Come experience his newest additions, Palouse Landscape, Main Street Accident, and Jil Orders Cherry Pie (at the Uniontown sausage feed). Nona Hengen shares two of her high quality framed Giclees ready for hanging. “Making Sauerkraut” pays homage to her mother’s 1931-1936 diary entries speaking to the annual fall ritual. In the haunting, “Summer’s Labor’s Lost,” sunlight plays upon the dust covered jars fill of an abandoned homestead root cellar. Ken Carper is now showing “Palouse in Transition, Silver White Winter Melts Into Spring.” This collection of images beautifully captures the seasonal transitions of our region. Additional artists include: Vicki Broeckel, Carrie Vielle, Bob Krikac, and Rob Smith. Libey Gallery hours are Mondays – Wednesdays 10 a.m. to 8 p.m., Thursdays – Fridays 10 a.m. to 6 .m. and Saturdays and Sundays 1 to 5 p.m. For more information about The Libey Gallery, contact the Colfax Branch of Whitman County Library at 509-397-4366 or visit 102 S. Main Street, Colfax. 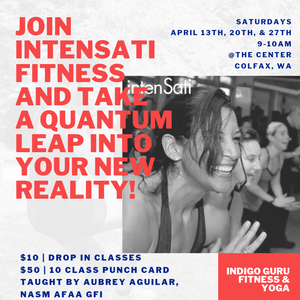 Intensati is a combination of high energy aerobics, martial arts, strength conditioning with spoken affirmations and meditation. Cost is $10 per class or $50 for 10 punches. Try your first class for free! Contact Aubrey for additional information at (509) 553-3752.